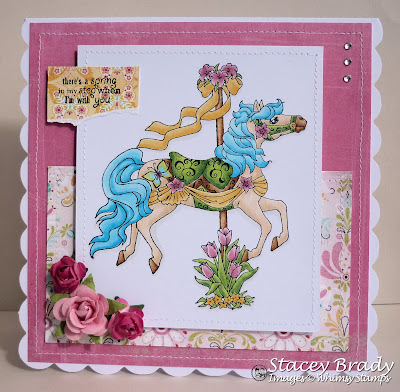 Crafting Adventures: A Spin on the Merry Go Round - A Whimsy Blog Hop! A Spin on the Merry Go Round - A Whimsy Blog Hop! Hey everybody and welcome to my 2nd post of the day! Double posting is a bit of a rare occurance for me but it's with very good reason - I'm the 10th stop on the Whimsy Merry Go Round blog hop! If you have spun here from our wonderful illustrator CRISSY'S blog, then keep reading. If not, you are going to want to bounce right back to the fabulous BEV'S blog, right at the start of the hop. Isn't she gorgeous?! I figured that she is so colourful, she just had to be a girl! That's one of the things I love most about these images actually - you can really let loose and colour them just how you want. So much fun. The other great thing about these stamps is that each one comes with an accessory stamp and a couple of sentiments. What a total bargain, huh?! Stamps: Spring Stepping by Whimsy Stamps. Paper: Basic Grey 'Urban Prairie'. Copic Markers: E31, E33, E35, E37, E50, E51, E53, B00, B02, B05, Y17, Y21, YG03, YG63, YG67, R81, R83, R85. Tools & Embellishments: Machine stitching, Prima roses, gems and smaller flowers from stash. Stamp with Fun - Spring. Ooh La La - Anything Goes. Secret Crafter - Anything Goes. Incy Wincy Designs - Horse. Challenge Up Your Life - Flowers. Paper Cutz - Anything Goes. Stampin' B's Design Team - Spring or Easter. Make sure you ride the merry go round to the very end as you may be in with a shot at winning this little lot! The prize includes: Proud Momma Stamp Set, Spring Stepping Stamp Set, Wings of Hope Stamp Set, two pieces are satin ribbon, a package of ICE sticky gems, and 10 two-tone pink Prima roses. Whimsy Stamps will be offering a special promotion from noon EST on Sunday until noon EST on Monday. The first 25 orders placed at Whimsy, regardless of total, will receive free shipping. Shipping will be charged at checkout, but if your order was one of the first 25 orders in that 24 hour period, you will receive a shipping credit. This is a one day only special promotion during our new release! Phew! Well, that's it from me. Thanks for visiting me today and for any lovely comments you may leave. Now it is time to spin on to CRYSTAL'S blog.....! It´s just beautiful. I love the colours and the details. wow stacy - just love the brightness of this card !! gorgeous ! Gorgeous creation with a wonderful image. Hi Stacey this is stunning love the image colouring great layout gorgeous card..love it. Stacey this is soooo lovely!!! Wonderful spring colors!!! What an amazing job you did with these new images!!!! Very cute card. This stamp is so sweet. great card, the colour on its mane and tail is fab ! Oh my goodness this is gorgeous!!! perfectly colored. And I LOVE how you stamped your sentiment! I have all little bits of DP I can't bear to throw away now I have a beautiful use for them!! PerfecT! Absolutely stunning cards. I love the pretty spring colours and fabulous details. Thanks for the chance to win. What a beautiful, magical card stacey! so pretty! How gorgeous Stacey! Love your colouring and I really love the cleaner look of your card-works beautifully! Gorgeous card Stacey - such pretty colours! Wow -- this is just so pretty. So pretty, Stacey! I love the stitching and that background paper! The coloring is fabulous! I love how Springy this is! Hi Stacey! Lovely card and your colouring is amazing. TFS! Stunning card! Love the colours and the papers you've used. Stacey, your card is so cute! Love the gorgeous colours you chose Stacey. Your card looks so pretty. Great stitching too. Oh my.... this is so pretty! I love the papers you used and the happy colors and patterns.... just make me smile! This is just beautiful!! I just love your stunning coloring of the carousel horse, the spring colors, the stamped sentiment on the dp and all your accents. The bluey turquoise mane & tail really make this a Carousel horse. I love the colour combinations you have used here. They are beautiful. Oh my goodness. Beautiful card. Beautiful card Stacey. Love the colors. beautiful card and good colors. good attention to detail! Gorgeous love the colours, so pretty. Such a lovely card. Love the papers. Stacey this is soooo lovely!! Great colors! a very nice card. I am amazed only so much beautiful this card. I love it, that with a blue colour the mane of the horse. Stacey -- this is so pretty! So magical! So lovely! TFS! This is gorgeous, love the blue hair. Stunning card. Lovin these new images. Great colouring. Beautiful colouring, loving these carousel images and so much variety on the creations! I love your card Stacey! The colors and design are so pretty! Please stop by Create With Joy when you have a moment - would love to say hello! Beautiful card, love the colours you used! A card with a great spark of spring! Lovely combination of colors and the finishing touch of stitching is adorable! AFA, ASFS and a BIG Growl at Blogger! Anyone for Anya? - Mum's the Word!